This fluid, solvent-free painting medium supports a broad range of painting techniques with minimal compromise across color, dry time, texture and mark-making. It gives colors more flow and transparency. This medium increases gloss and has a moderately fast drying rate. 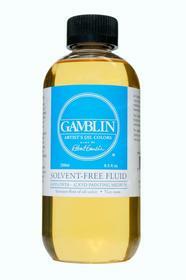 The non-toxic fluid contains no Gamsol or petroleum distillates, and is made from safflower oil and alkyd resin.